This Bizarro cartoon made possible by an imaginary grant from the crazy old woman who hangs out in front of my building. I'm not particularly fond of this cartoon, to be honest. It's a fairly simple play on words but I often find that this sort of cartoon is popular with a lot of readers, especially those trapped in a cubicle laboring at a dead-end job. I hope some of you like it. I roll my eyes at "outside the box" jokes, because they have been done to death. but, this one. hah. This is good enough to stick it on my cubicle wall. if I had a cubicle, which I don't. in fact, I may get a cubicle job just so I can put this on my cubicle wall. I don't get it. I showed it to the guy who works in the sphere next to me and he didn't get it either. Always the joker, executive producer of “TV’s Bloopers and Practical Jokes” Lloyd, enjoyed playing pranks on new employees. "You said left, right, down three cubes, left, go to the fire extinguisher, turn right, open the door in the middle, go up 2 flights of stairs, spin in a circle, close your eyes and say "cheez whiz"? That is the quickest way to conference room B? Should I spin clockwise, or counter clockwise?" 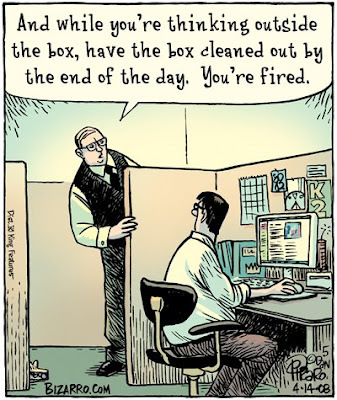 I thought this was hilarious, but that's because I hear the chracter's voice in my head like this: (boring) "And while you're thinking outside the box, have the box cleaned out the end of the (mean) day. (short pause) You're fired." It's all about timing, which I don't think most readers use when they read dialogue.